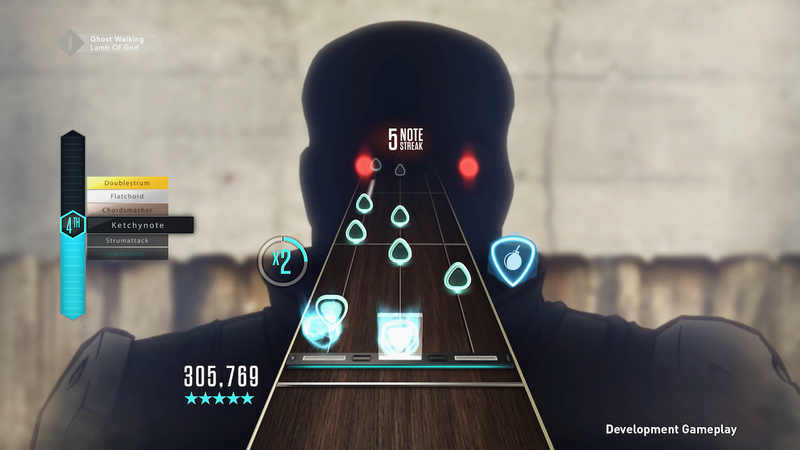 Once one of the biggest franchises in videogames, Activision’s Guitar Hero series has been dormant since 2010. 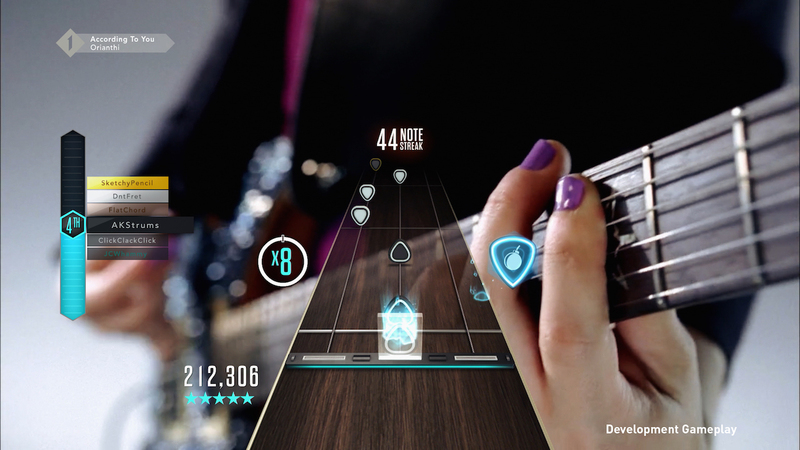 That’s going to change on October 20, 2015 with the release of Guitar Hero Live. With a reimagined guitar controller, a revamped visual style, and an all-new GHTV mode, Activision hopes that Guitar Hero Live will appeal to a new generation of gamers and longtime fans of the series. 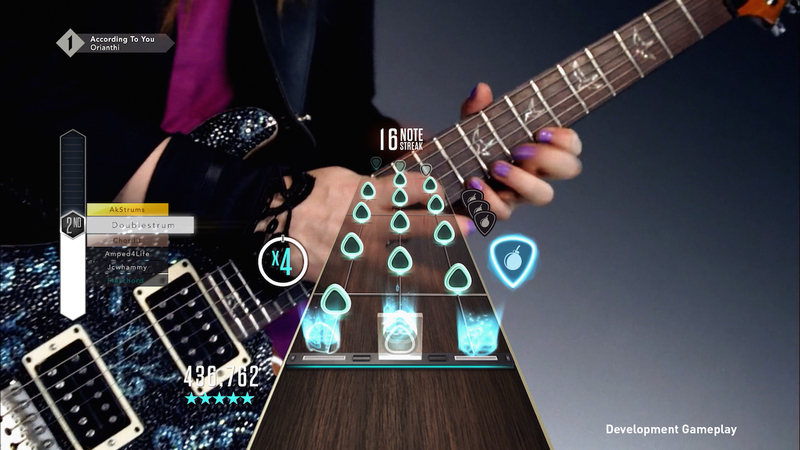 The biggest and most obvious change to Guitar Hero Live is the controller. Instead of a single row of five buttons, the new controller features two rows of three buttons. In normal and harder difficulties, the new button arrangement is pleasantly challenging; you’ll often have to hit multiple buttons in multiple rows. For newcomers and those that enjoy music games but aren’t very good, the easier modes allow for single-row play. It took me several songs to get used to the new controller and even then I didn’t have enough time with it. I enjoyed being challenged by the different permutations of button presses. 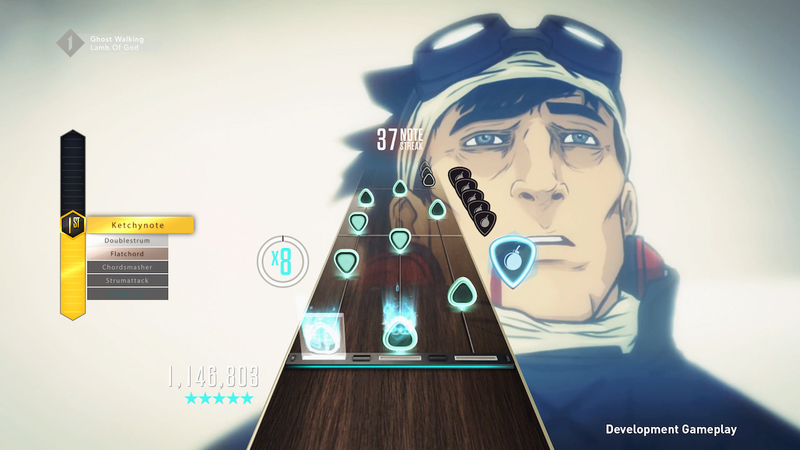 The dual-row “chords” make the game more interesting and difficult (in a good way). While some claim that Guitar Hero Live approximates power chords, I disagree. The game is certainly more fun with the new controller, but still a far cry from playing an actual guitar. I don’t see that as a fault at all (go play Rocksmith for that) — just disagreeing with some game writers. The first three Guitar Hero Live songs I played were a mess due to a combination of the new controller and songs I was completely unfamiliar with. I recall butchering a song by The Black Keys, murdering a Fallout Boy song, and demolishing two songs by two bands I never heard of (I fail at modern music, fyi). After getting accustomed to the new controller and switching to a different kiosk that had songs I knew, the game was easier. Part of it was simply spending time with the controller, while part of it was my deep love of Warrant and Faith No More. 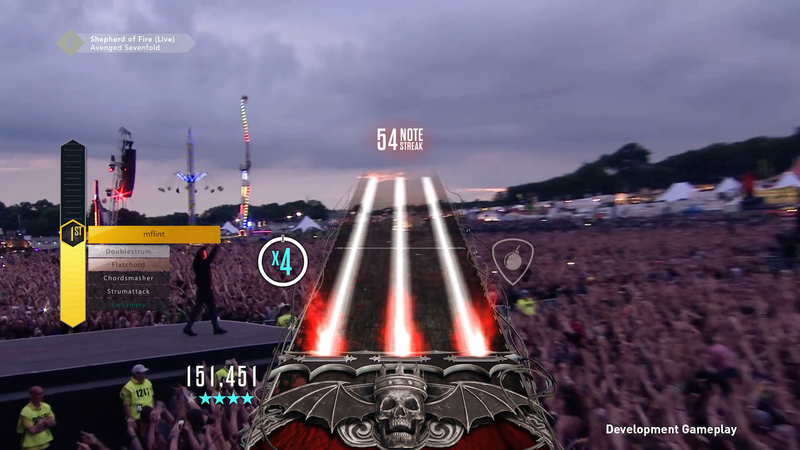 Guitar Hero Live adds some significant visual changes too. 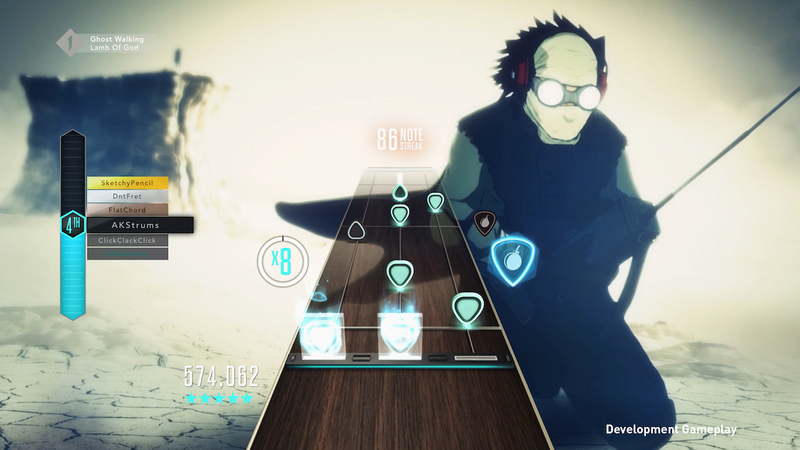 Instead of cartoon-like graphics, the game uses live concert footage from the perspective of the guitar player. You’ll see your bandmates and the crowd as you play. The visuals change depending on your performance. I’ve never paid too much attention to the graphics in previous Guitar Hero games and the new graphics were mostly lost on me in the bit of Guitar Hero Live I played. I’m so focused on the notes that I block out most of the visuals. That said, it was cool to watch other people play and there are plenty of gamers that watch the whole screen while they play music games. 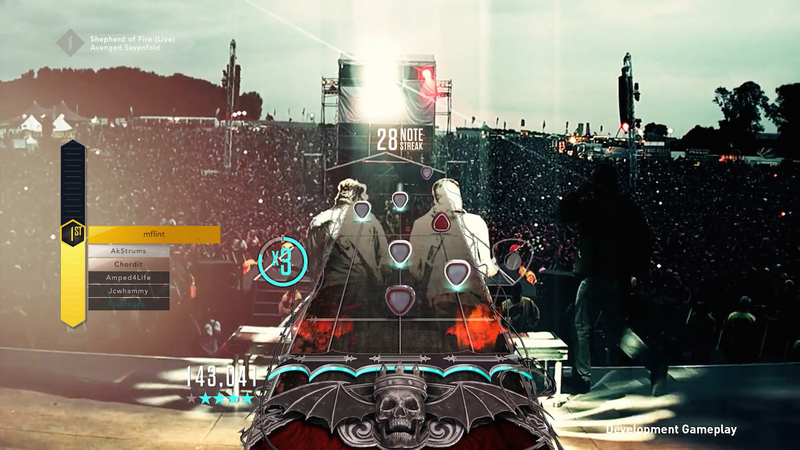 In addition to the main “Live” mode, Guitar Hero Live features GHTV mode. 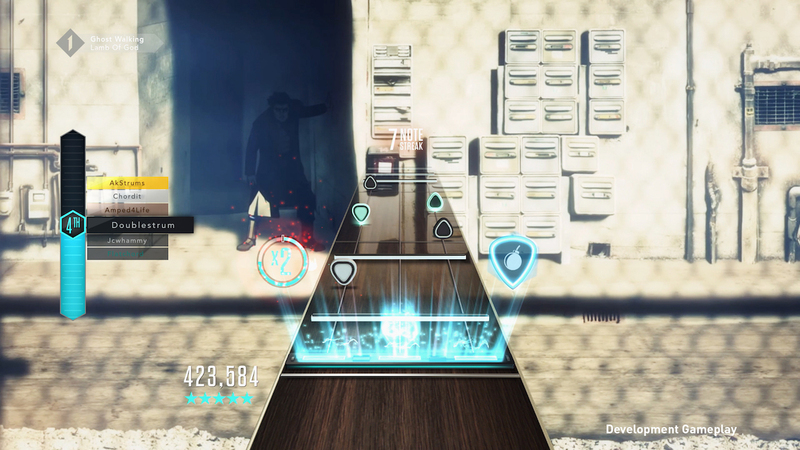 This mode features different channels of music, allowing constant access to a variety of new songs and different genres. Songs in GHTV mode feature music videos from the associated acts, as opposed to concert footage in Live mode. While you can play along with a GHTV song as it’s streaming, replays require a microtransaction purchase. It’s an interesting approach compared to traditional scheduled downloads, but I’m not sold on it just yet. I need to experience GHTV when it’s full functional and accessible to millions of players before making any judgements. 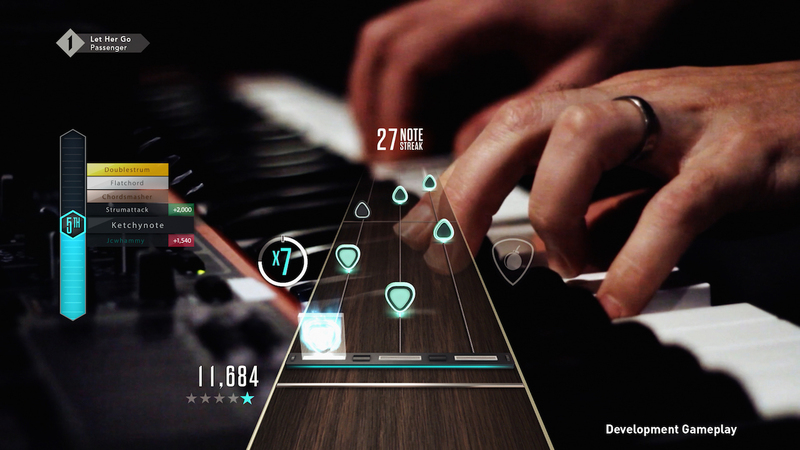 If you’re interested in the developer of Guitar Hero Live (and I hope you’re interested in all creators of the games you play) then check out FreeStyleGames. Acquired by Activision in 2008, the company has experience with music games, including B-Boy, DJ Hero, and Sing Party. For the most part, I enjoyed the brief time I spent playing Guitar Hero Live and am excited to play more. Part of it is that I haven’t touched a music game in years and part of it is because the new controller is lots of fun. I’m confident that fans of the old Guitar Hero games will enjoy Guitar Hero Live and curious to see if it will appeal to younger games (i.e. those pesky Snapchat kids). Guitar Hero Live will be available on October 20, 2015 for PlayStation 4, Xbox One, Wii U, PlayStation 3, and Xbox 360. It is a marvelous week to be a gamer! Millions of people will be picking up Pokemon X and Pokemon Y this week. As someone that spent 700+ hours on Pokemon Pearl and a former writer of a weekly Pokemon column, I’m completely psyched for this game. Another one that’s high on my personal wish list is Beyond: Two Souls. Most of my videogame-journalist friends love it, but a few of them aren’t into it. It really depends how much of a Quantic Dream mark you are. As many of you know, I’m a big-time mark for Quantic Dream games. Fans of awesomely quirky and wickedly deep tactical RPGs should definitely pick up Disgaea D2: A Brighter Darkness. I absolutely love that series. Honestly, between the three games I just mentioned, I could be a happy gamer for the rest of the year (and more). Lastly, two game-of-the-year editions are hitting store shelves, for those of you that have missed them: Borderlands 2: Game of the Year Edition and Dishonored: Game of the Year Edition. So, any of you picking up new games this week? With the Yankees 2013 season ending in failure, I’m ditching baseball and getting psyched for the 2013-2014 NBA season. NBA 2K14 should be a great help. I have no idea how this season will end, but when I play, the Miami Heat will not win another title. I know that many of you regular RPadholics aren’t big on the Nintendo 3DS platform, but there are a pair of lovely JRPGs hitting the Nintendo handheld this week: Etrian Odyssey Untold: The Millennium Girl and Rune Factory 4. Lastly, Ubi Soft has a pair of trilogy bundles for those looking to maximize their gaming dollars: Assassin’s Creed Ezio Trilogy Edition and Tom Clancy’s Ghost Recon Trilogy Edition. Embedded below is the opening cinematic for Final Fantasy XIII: Lightning Returns for PlayStation 3 and Xbox 3. The five-minute clip is a typical Square Enix cinematic, which is to say that it has some of the most gorgeous visuals you’ll see on a console. Keep in mind that some of the details are lost due to YouTube compression, but I assure you that the Lightning Returns video is quite dazzling. The clip shows several familiar faces and some new ones. As you’ve probably figured out, Lightning isn’t dead, which kind of makes her the Jean Grey of the Final Fantasy universe — she’s alive, she’s dead, no wait she’s alive again, lather and repeat as needed. Many longtime fans have blasted the Final Fantasy XIII series, but I’ve enjoyed it. Yes, it’s quite different from the older games and the exploration aspects are either non-existent or minimal, but the games’ others aspects have entertained me. With that in mind, I’m really looking forward to Lightning Returns. I’m curious to learn about how she came back and to see how her conflict with Snow is resolved. That said, I’m sure there will be plenty of other details that will confuse the hell out of me. While I’m certain that the graphics, gameplay, and music will be strong, I’m only mildly hopeful about Lightning Returns‘ story. It’s true that several Square Enix stories make more sense with iteration (it took more than a decade, a PSP prequel, and an animated feature for Final Fantasy VII to make sense), but many gamers still find several Square Enix tales confounding. I love me some Kingdom Hearts, for example, but I need to keep the Wikipedia page handy to keep up with the plot and characters. Anyway, check out the Final Fantasy XIII: Lightning Returns opening cinematic below and let me know what you think of it (please!). Are you excited for the game? Is it a day-one purchase for you? Grand Theft Auto V will hit store shelves this week. That’s pretty much all you need to know, right? Rockstar’s latest GTA will be one of the biggest games of 2013, if not the biggest. If you’re late to the PlayStation 3 party, you can pick up the GTAV PS3 500GB bundle. If open-world hyper-violence isn’t your thing then there’s…uh…Hot Wheels World’s Best Driver and We Sing: 80s. Right. So, who’s picking up Grand Theft Auto V this week? Anyone? Anyone? Rockstar Games has posted a gameplay trailer for Grand Theft Auto Online (embedded below). Based off of the video, the game looks like an impressive mix of GTA gameplay, competitive play, cooperative play, and user-created content. That’s…impressive. There’s a very high chance that people will be drawn to the game because of the Grand Theft Auto name and stick around because there’s so much to do. On paper, I really love the diversity it offers; players that enjoy beating each other up can play competitively, those that enjoy tearing up cities with expertly coordinated team-based attacks can play cooperatively, and creative types can construct all kinds of things for players to enjoy. Now that the trailer is up and you’ve had some time to imagine the possibilities, I’d love to hear what you think about Grand Theft Auto Online. Is it something you’d play? Do you think it will be another smash hit by Rockstar? Do you think we should start an RPad.TV gang? What kind of gang would it be? Would we terrorize cities? Try to make the world a better place? Or crumble due to infighting? Leave a comment and let me know (please!). Activision has posted a multiplayer trailer for Call of Duty: Ghosts. I’m looking forward to the game, but honestly, I’m more into the Skylanders franchise these days. However, I know that several of you RPadholics are into the franchise, so kindly check out the video below and let me know what you think. Square Enix has released a new trailer for Kingdom Hearts HD 1.5 Remix for PlayStation 3. For those of you not familiar with the compilation, it serves up Kingdom Hearts 1 Final Mix, Kingdom Hearts Re:Chain of Memories, and Kingdom Hearts 358/2 Days with updated graphics. Even with the refresh, the footage in the video (embedded below) looks so dated to me, but I’m still utterly charmed by these games. I love the characters, cameos, and gameplay. Although the story can be confusing (in that JRPG way), the elements that are easy to understand have so much heart. Even though the graphics aren’t that improved, I still want to dive into the Kingdom Hearts world when this compilation is released. How about you? Any of you amped for Kingdom Hearts HD 1.5 Remix? Also, I wish I had a gummi ship. Disgaea D2: A Brighter Darkness Trailer Rules! I was totally charmed by the Disgaea D2: A Brighter Darkness trailer below. The game is part of the series’ 10th anniversary celebration. It has everything I love about Disgaea games — cerebral gameplay, cute character design, quirky humor, fun music, and a surprising amount of heart. I expect it to have an insane amount of the depth too, so expect me to disappear for a few weeks in October after the game is released. A Disgaea hibernation session will be in order. Check out the clip when you have a chance and let me know what you think of Disgaea D2: A Brighter Darkness (please!). Flonne rules!!! Author RPadTVPosted on July 24, 2013 July 24, 2013 Categories PS3, VideogamesTags PS3, VideogamesLeave a comment on Disgaea D2: A Brighter Darkness Trailer Rules! As a mark for the developer, I’m completely psyched for this game and really enjoyed this “making of” video. Check out the clip and let me know what you think (please! ).